Shiny Piplup in game: 27 Who? Important notice! Pokemon Shiny Piplup is a fictional character of humans. Piplup (Japanese: ????? Pochama) is a Water-type Pokémon introduced in Generation IV. It evolves into Prinplup starting at level 16, which evolves into Empoleon starting at level 36. 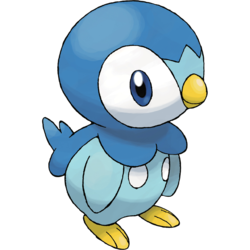 Along with Turtwig and Chimchar, Piplup is one of three starter Pokémon of Sinnoh available at the beginning of Pokémon Diamond, Pearl, and Platinum. Piplup has a strong sense of self-pride. Because of its pride, it has a hard time accepting food from humans and bonding with its caretakers. It will even puff out its chest after it falls down, which it often does due to its poor walking abilities. However, it is a skilled swimmer that can dive for over ten minutes in order to hunt. It has also been shown to fly short distances in the anime. It lives along the seashore in colder climates. Dawn began her journey in Sinnoh with a Piplup. In Following A Maiden's Voyage!, Piplup and the starter Chimchar got into a fight over their food, with Piplup causing chaos by using BubbleBeam on the interior of Professor Rowan's lab in pursuit of Chimchar. The two escape, and Dawn is given the task of finding them. She finds Piplup, and the two narrowly escape an Ariados attack. Back at Rowan's lab, Chimchar having been found by Rowan's Staraptor, Dawn chooses Piplup. As the Diamond & Pearl series continued, Dawn kept Piplup out of his Poké Ball more and more often, much like Ash does with his Pikachu. 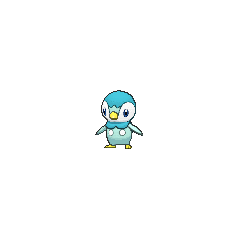 A Piplup, who used to be a human, is also one of the two main members of Team Poképals in the Pokémon Mystery Dungeon: Explorers of Time & Darkness and Pokémon Mystery Dungeon: Explorers of Sky - Beyond Time & Darkness. Tyler, a rookie Trainer that appears in The Thief That Keeps on Thieving!, has a female Piplup nicknamed Pippy. He uses her to capture a Yanma. She is different from other Piplup because she wears a tiara. 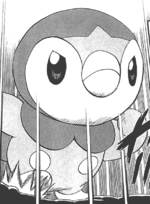 Another Piplup owned by Rowan appears in SS024. A Piplup appeared in Alexa's magazine in The Journalist from Another Region!. A Piplup appeared as a plush toy in A Jolting Switcheroo!. Multiple Piplup appeared in Going for the Gold!. A Piplup appeared in Pikachu and the Pokémon Music Squad. DP003 Piplup Ash's Pokédex Piplup, the Penguin Pokémon. It's very proud, and its thick down protects it from the cold. DP143 Piplup Lyra's Pokédex Piplup, the Penguin Pokémon. Although not the most sure-footed, it is proud nonetheless, getting right back up after a fall with head held high. BW086 Piplup Ash's Pokédex Piplup, the Penguin Pokémon. 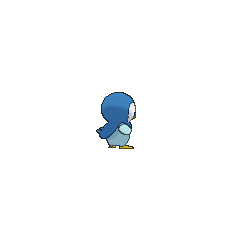 Piplup's limited walking skills often cause it to fall down, but that never hurts its pride. Platinum in Pokémon Adventures began her journey with a Piplup. It eventually evolved into a Prinplup and an Empoleon. Hareta randomly selects Piplup to battle the enraged Onix in the first chapter. After their first encounter with Onix, Hareta chooses Piplup as his first Pokémon. Piplup is originally disobedient to Hareta, but listens to him in order to defeat the Onix in their second battle. Dawn's Piplup appears in the following manga adaptations of Pokémon movies: The Rise of Darkrai, Giratina and the Sky Warrior, Arceus and the Jewel of Life and Zoroark: Master of Illusions, like in the anime is Dawn's main Pokémon. 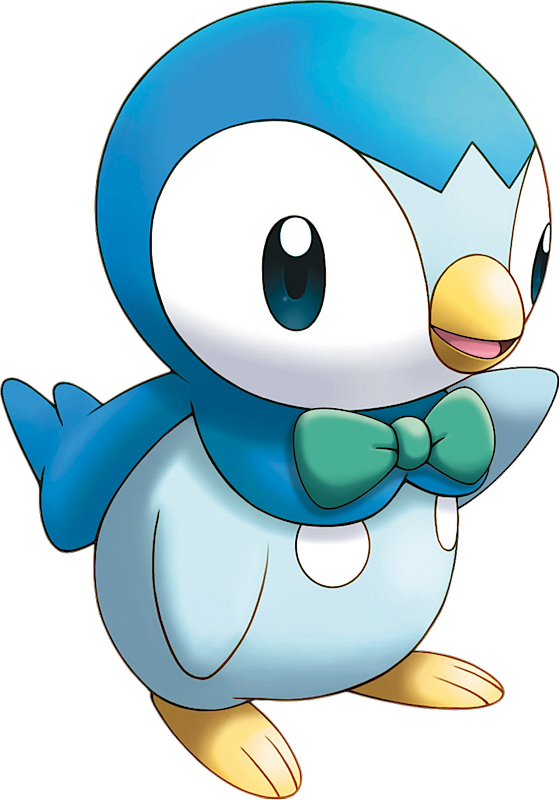 The role of Piplup is basically the same in all the chapters, however in most stories it is shown inside his Poké Ball and has fewer interactions with Pokémon present in the story. One Piplup figure has been released. On being released from a Poké Ball, Piplup slides along the stage using Surf. Anyone caught in it will be pushed until Piplup disappears, or pushes the character off the stage. Piplup will keep using Surf even when off the stage. A Penguin Pokémon. It's one of the starter Pokémon received from Professor Rowan when the player departs from the Sinnoh region. It's a Water type, so it's strong versus Rock and Grounds. It's very cute but filled with pride--it hates to accept food from people. When it levels up, it evolves into Prinplup. While Piplup no longer appears from Poké Balls, having been replaced by Oshawott, it makes a cameo appearance in the Kalos Pokémon League stage. When the stage transitions to the Flood Chamber, it can be seen in the background along with Blastoise, Wailord, and Clawitzer. You wouldn't think it from its adorable exterior, but this Pokémon is very proud and often won't listen to its Trainer. When it walks on land, it waddles and even falls over sometimes, all in a suitably cute way, but once it's in the water you'll see its true potential. It's a skilled swimmer and can dive for over ten minutes at a time to hunt. In PokéPark Wii: Pikachu's Adventure Piplup is one of Pikachu's best friends. He is found keeping a trapped Wynaut company in the Beach Zone after falling through the mysterious tunnel. Once the Wynaut is safe, he takes a Pikachu shaped hot air balloon back to the Meeting Place where he mends it. He later accompanies Pikachu to the Sky Pavilion along with Chikorita and Charmander where he meets Mew. 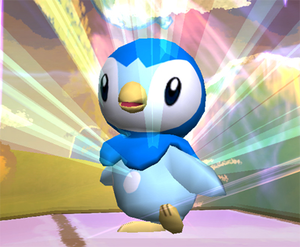 Piplup returns in PokéPark 2: Wonders Beyond where he and Pikachu arrive at a new PokéPark. They venture into the Wish Park together and try to save some of the Pokémon trapped there. Piplup inevitably becoming trapped in the Wish Park after saving Pikachu and Oshawott's lives. He is later found by Zorua and Zoroark and announces that he wishes to stay in Wish Park so he can help the Pokémon who are coaxed into coming. Piplup is later taken by Gothitelle in exchange for setting Victini free, where he is then manipulated by Darkrai. Piplup later awakens Pikachu from Darkrai's nightmare and encourages Pikachu to seek out his missing friends after their memories were taken by Darkrai right before the final battle. It lives along shores in northern countries. A skilled swimmer, it dives for over 10 minutes to hunt. A poor walker, it often falls down. However, its strong pride makes it puff up its chest without a care. It doesn't like to be taken care of. It's difficult to bond with since it won't listen to its Trainer. Because it is very proud, it hates accepting food from people. Its thick down guards it from the cold. Moves marked with a superscript game abbreviation can only be bred onto Piplup in that game. It spits water to attack. Piplup is your best friend. He followed you through the Mysterious Tunnel. He landed in the Beach Zone. He wishes he could fly. Pikachu's childhood friend. He called Pikachu to have an adventure in PokéPark with him. He is serious about everything. 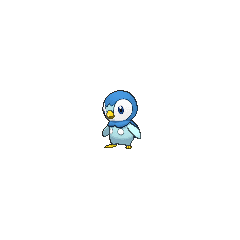 For other sprites and images, please see Piplup images on the Bulbagarden Archives. Piplup is the most selected Sinnoh starter Pokémon in the anime. It has been the starter Pokémon of Dawn, Kenny, and Tyler. Piplup was designed by Yusuke Ohmura. Piplup is based on a young penguin, or possibly a Little Penguin. The light blue crown-shaped marking above its beak may be inspired by Emperor Penguins. Piplup is derived from plop or plup from the sound of a pebble hitting water. It may also incorporate pip, a stage of growth in baby birds immediately before they hatch from the eggshell. Pochama is derived from ?????? pochapocha (the sound of a pebble splashing in water). It may also incorporate ????? botchama (child).